I am running late as usual with the craft box which is supplied by Tots100 and with the weather being rather dismal Grotbags wanted to create a garden for indoors. Using an old candle tin which she decorated with cute bugs and filled with dirt and stones to hold her creations in place. Using a variety of materials she made her fairy garden. 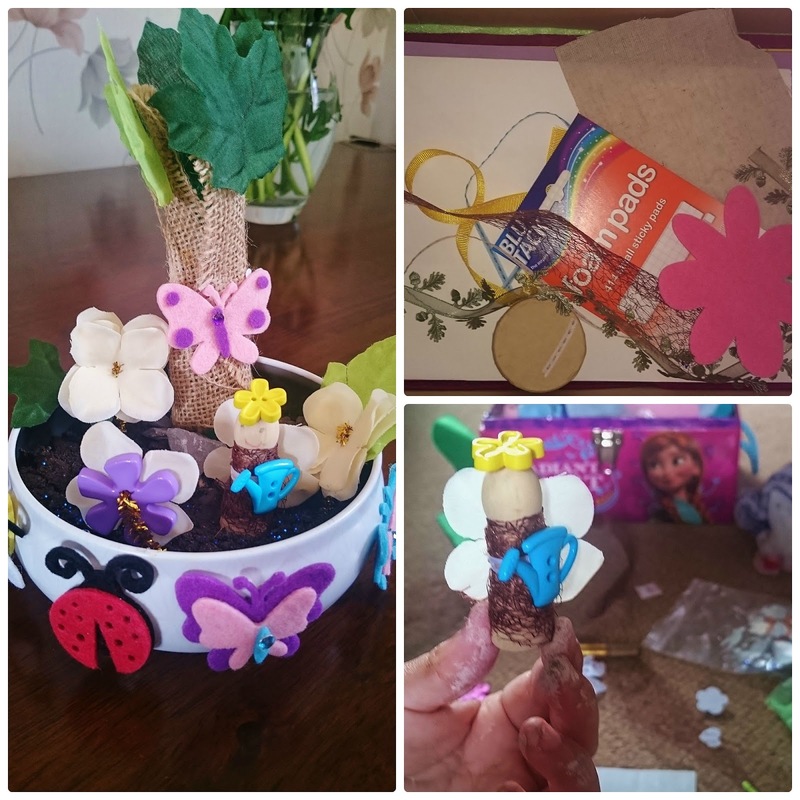 Flowers were created with pipecleaners and petals, the tree was made with a lollipop stick wrapped in hessian and large leaves and the fairy itself was made out of a wooden shape which she added wings too, a flower as a hat and a watering can to water the garden. 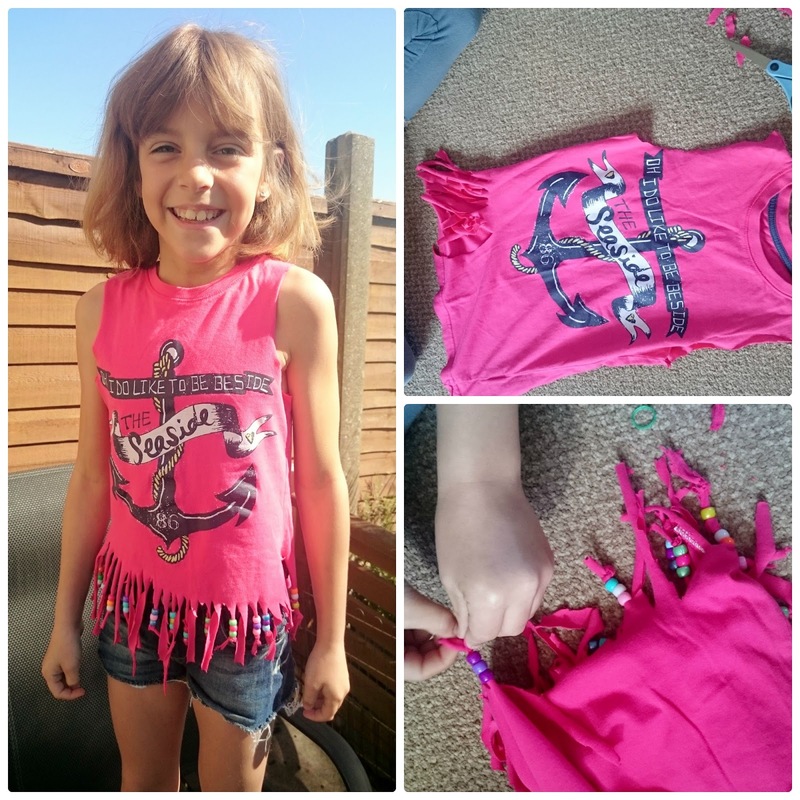 Secondly she wanted to create something for outdoors and after watching youtube for hours she set to turning an old t-shirt into a fashionable item of clothing for those hot summer days outdoors. By cutting the sleeves out and cutting up in to the t-shirt itself from the bottom she created a ragged hemline which she then threaded beads on to. I think the t-shirt looks amazing and it was something she really enjoyed doing. She had so much fun creating this item of clothing which otherwise would have been in the charity box. Oh wow what lovely and simple crafts = perfect to keep kids entertained this summer.